This meme is hosted by Lori at Pure Imagination. This series is one that I devoured all the way up to book 13. But by then, I couldn't take the same storyline, the same plot and the same way that the author doesn't make her main character decide who is going to be her significant other. Will Stephanie Plum ever have a HEA? Although some of these characters that Evanovich has written are just down-right hysterical (Grandma Mazur, Lula and the various creeps that Stephanie hunts), it wasn't enough to keep me going on. 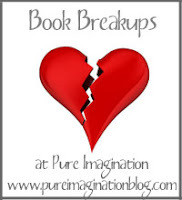 What book break ups do you have? Is there a popular series that you have broken up with? Let me know in the comments! I broke up with the Black Dagger Brotherhood. Reason are too many to list - lets just say it took a direction I just didn't like and I lost interest.